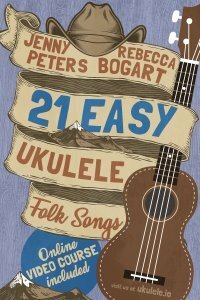 Here’s where you’ll access the lesson videos that go with 21 Easy Ukulele Folk songs. We hope you’ll visit often. Click on the tabs on the left side of the screen to get started. If you’ve gotten started on the ukulele and are looking for more easy material to build your skills, this is the book for you. We’ve written it specifically for beginning ukulele players who have learned the C, F, and G7 chords and a few basic strums. We’ve arranged the book so you can master the easiest music first and then gradually tackle harder tunes as your skills improve. Not yet a member? Get your copy now!